Prosthetics like the preservation implant protect more healthy bone. Not all procedures are equally invasive, and surgeries like the MAKOplasty may improve function and accelerate recovery. The most severe cases of knee osteoarthritis are treated with a total knee replacement. This highly invasive surgery involves removing large portions of bone in order to attach metallic prosthetic substitutes. The surgery is highly traumatic and requires a lengthy recovery. This makes a total knee replacement a difficult option for older or infirm patients because slow healing may make full recovery difficult or impossible. Total knee replacements are also problematic for very young and very healthy people because the implants typically last only 5-10 years. When the original prosthetic implant is replaced, even more bone must be removed to anchor the new, larger implant. This means that a 50 year old man with severe knee osteoarthritis who has a total knee replacement can expect more highly traumatic surgeries every 5-10 years for the rest of his life. As he ages and his healing slows down, the recoveries for each surgery will be longer as well. Fortunately, a total knee replacement is not the only surgical option, even for the most severe patients. Osteoarthritis affecting only one side of the knee has been effectively treated with partial knee replacements for many years. Robotic technology has vast surgical applications, and has recently been employed in a new procedure called a MAKOplasty. The MAKOplasty uses robotic arms to trim away only the damaged bone, and to create and implant a unique prosthetic that complements the healthy tissue. This means that healthy, well vascularized bone is not removed, and so there is much less trauma and a faster recovery. This procedure may not be appropriate for everyone but the MAKOplasty and other partial replacements could be a more conservative surgical treatment. If your doctor recommends joint replacement surgery, ask about your options. You may not need a total joint replacement to get the best results. The KineSpring system unloads the medial compartment throughout a broad range of motion. Moximed’s KineSpring system was developed as a surgical intervention for osteoarthritis of the knee that is not as severe as a joint replacement. If the medial compartment of the knee is under abnormal stresses, it can lead to extreme knee pain. This pain, and the osteoarthritis that causes it, is often treated with anti-inflammatories, rest, diet, exercise, and ultimately a partial or total knee replacement. This final stage of treatment, the joint replacement surgery, is highly traumatic. Joint replacements involve the removal of entire sections of bone to be replaced by metallic prosthetics. Instead of removing damaged bone, the KineSpring system offers an implantable spring that could let the injured tissue heal. The spring unloads the medial compartment of the knee throughout a broad range of knee motion, allowing high user function while promoting tissue repair. This is especially important because knee motion is crucial to bone and cartilage growth. If you are considering a medial compartment knee joint replacement, the KineSpring may be a less severe and similarly effective alternative. But do not mistake this post as an endorsement of the KineSpring system for osteoarthritis of the medial compartment. The KineSpring is a surgical replication of an orthotic solution. In other words, a knee brace for osteoarthritis offers all of the benefits of the KineSpring system without the needless risk of undergoing surgery. So if you suffer from osteoarthritis of the knee, ask your doctor about orthotic solutions before you move on to surgical ones. Braces are safer, less expensive, and far more easily removed than surgical implantations. The United States Chapter of the International Society of Prosthetics and Orthotics held its bi-annual meeting in Honolulu this week. Dr. Frank Gottschalk presented a half hour lecture titled, “Amputation Following Failed Infected Knee Arthroplasty”. Dr. Gottschalk stressed the fact that total knee arthroplasty is a safe and common procedure, and explained that only less than 1% of patients succumb to infections. However he believes that this problem could become more prevalent by 2030. Dr. Gottschalk quoted statistics that there are approximately 500,000 knee replacements performed in the United States each year. That number will swell to 3.5 million annual surgeries by 2030. His research indicates that there are specific risk factors that lead to infections post surgery. Diabetes, morbid obesity, smoking, rheumatoid arthritis, steroids, and revision surgeries are the primary culprits. Knee replacement surgeries for these osteoarthritis patients are usually a last resort. The infections are of the staph, MRSA, and Gram Negative varieties. 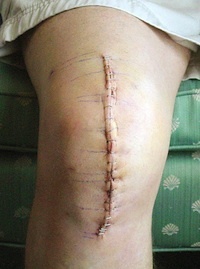 Approximately 90% of the patients who succumb to infection post knee replacement surgery are treated successfully, but some conditions will deteriorate to the point where a limb will have to be amputated. Dr. Gottschalk informed the audience of prosthetists about what types of patients will be successful candidates for prosthetic restoration. He stressed that when a patient is motivated they can have the potential to accomplish anything. His statistics show that younger patients who lose limbs following an infected knee replacement will have a good chance of becoming active community ambulators. Dr. Gottschalk explained that elderly and morbidly obese patients will often times not be candidates for artificial legs and will most likely be confined to wheelchairs. He concluded by saying that the more surgery a patient is exposed to, the more scar tissue will develop. Scar tissue decreases functionality. So it is in the patient’s best interest to keep the revisions to a minimum. Frank Gottschalk, M.D. is a professor at the Department of Orthopaedic Surgery at the University of Texas Southwestern Medical Center at Dallas. Dr. Gottschalk serves on the Board of United States Member Society, International Society of Prosthetics & Orthotics. The rehabilitation process following knee replacement will vary. Expect to stay in the hospital from one to seven days following your surgery. The length of stay will depend on your strength and your at-home support. Protected weight-bearing with a walker or crutches is required until the quadriceps has healed and recovered. Continuous Passive Motion machines are often prescribed to enhance range of motion. Daily physical therapy will be required to restore motion, function, and strength. It will take about six weeks for you to walk with a cane, and full recovery should be expected after three months. Many patients kick themselves for waiting so long to have their knees replaced. After years of suffering with osteoarthritis it is a pleasure to be able to walk without pain. Partial knee replacement or unicompartmental arthroplasty (UKA) is intended for patients who have significant wear and tear to only one of the three compartments comprising their knees; unicompartmental osteoarthritis. The advantages of a partial knee replacement as compared to a total knee replacement is that the incision is smaller, the post-surgery rehabilitation is easier, better range-of-motion after surgery, the hospital stay is shorter, less blood is lost during the procedure, lower risk of infection, lower risk of blood clots, and revisions are easier if surgical complications present. Knee arthroplasty or knee replacement surgery replaces the anatomy of an osteoarthritic knee with prosthetic components. Generally the weight-beaing surfaces of the joint are replaced to relieve pain and improve function. Knee replacements can be partial or total. The surgeries are major, requiring intense physical rehabilitation and considerable post-operative pain. Recovery time can take weeks and the use of a cane or crutches is usually required. The results are usually impressive. A person who suffers for years with osteoarthritis in many instances will be able to walk pain-free and enjoy a full range-of-motion.